Robert McFarland (author) and Rama Dixit (illustrator) have teamed up to produce a wonderful book for children. The story is one that children will want to read over and over again. The illustrations are so bright and cheerful that they will captivate you as well as your child. And inside my rug, I’m warm, safe and snug. Snugg leaves the safety and warmth of his rug in the old house to play with all of his friends; the spiders, Itsey and Bitsey and the mice, Doc, Jake and Sadie, who live in the house, too. They decide to go exploring and discover a mysterious treasure. Then the “bad guys”, Skatt, the Rat and Doug, the Slug show up. Can the six friends deal with them in a very positiveway with these “bad guys” and show them the error of their ways? You must read this book to find out. I recommend this book for all children for the sweet rhyming story, with the rhyming and the beautiful illustrations. It will teach children that friends are important and working together is the best way to get a job done. Parents will love reading this book to their children (and might even sneak a peek on their own). 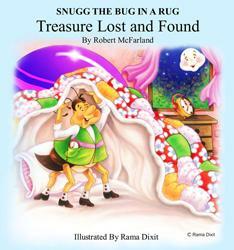 You can get the book through the Snugg the Bug website, http://www.snuggthebug.com/snuggs-shop, as well as Chapters, Peterborough; The Avid Reader, Cobourg; and Furby House in Port Hope, in Canada. It is not available in the United States, yet. Robert McFarland was educated at George Brown College in Toronto, Ontario Canada. He was a handyman for over 20 years, helping seniors stay in their homes as long as possible. When he retired, he began writing poetry. He now lives in Peterborough, Ontario, Canada, where he has spent most of his life. Rama Dixit lives in Mumbai, India and is a self-taught illustrator. She has been an artist since childhood and was mentored by Mr. D.H. Kunte, who taught her how to paint. “My initial works were for greeting cards, pharmaceutical visual aids and other stationery works. But that was not enough. I wanted to do something more creative and expand the line of my work,” Rama said. She made a conscious effort to specialize in children’s work, because reaching children’s emotions was a big challenge.